Prepare your tools and get everything ready before you start the project. 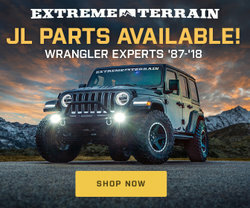 Park your Jeep on a level surface, apply your emergency brake and put your transmission in park or in gear if you have a 6-speed manual transmission. Chock the wheels. Ensure you have proper clearance and room to be able to insert the new gear oil bottle into the fill hole and tilt it upwards. 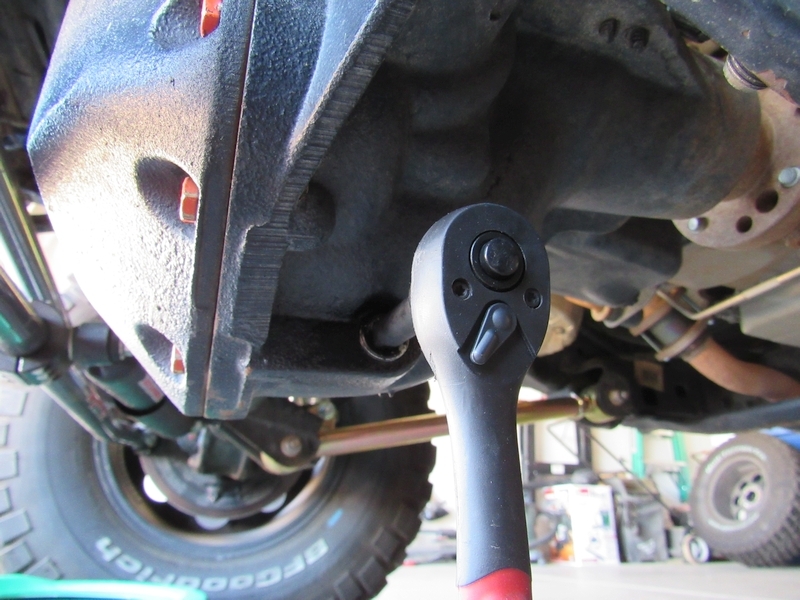 If necessary, you can jack up the frame of your Jeep and rest it on jack stands, to lift the track bar and drag link higher, above the differential. 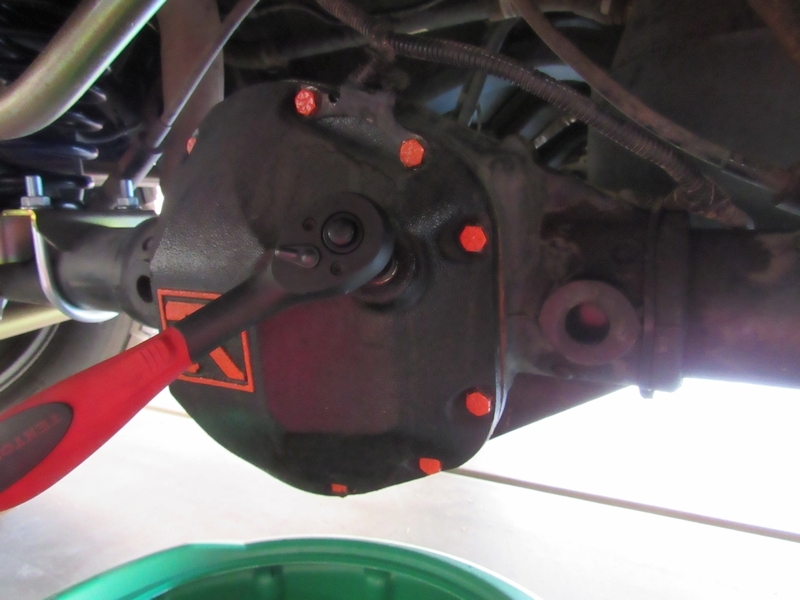 Locate both the fill bolt and the drain bolt on your differential. Remove fill bolt BEFORE removing the drain bolt. That way you can avoid a situation where you drain all the gear oil and then find out you have no way to fill the differential with fresh fluid. 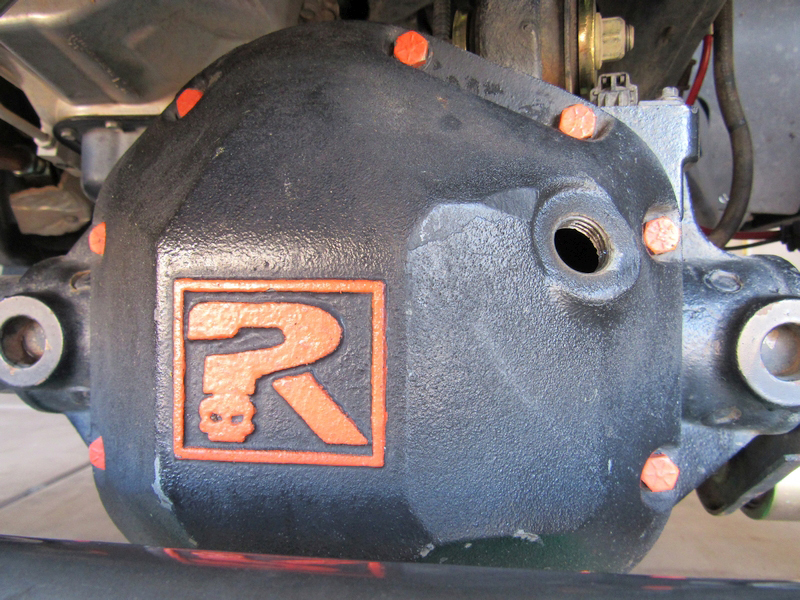 Using the square head of a 3/8″ Drive ratchet, remove the fill bolt from your differential cover. 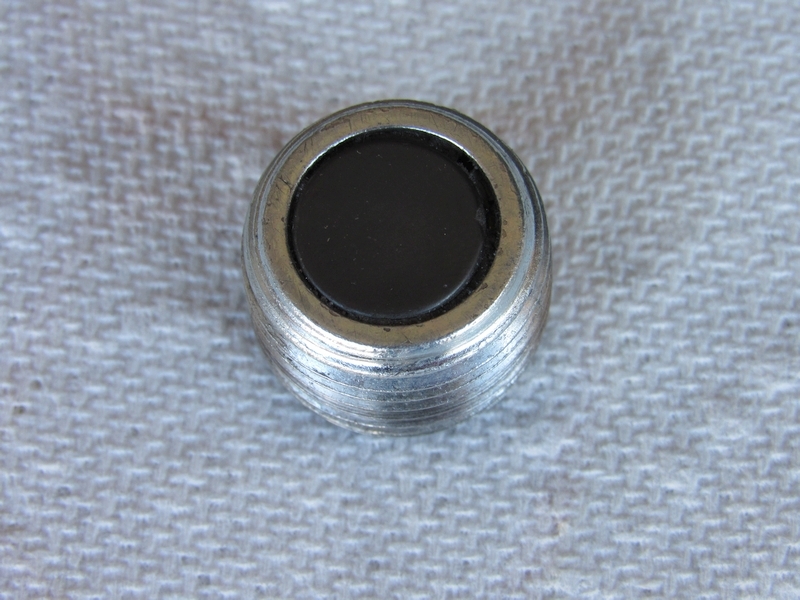 Some covers like Riddler use a fill bolt that requires use of a 3/8 hex bit to remove. 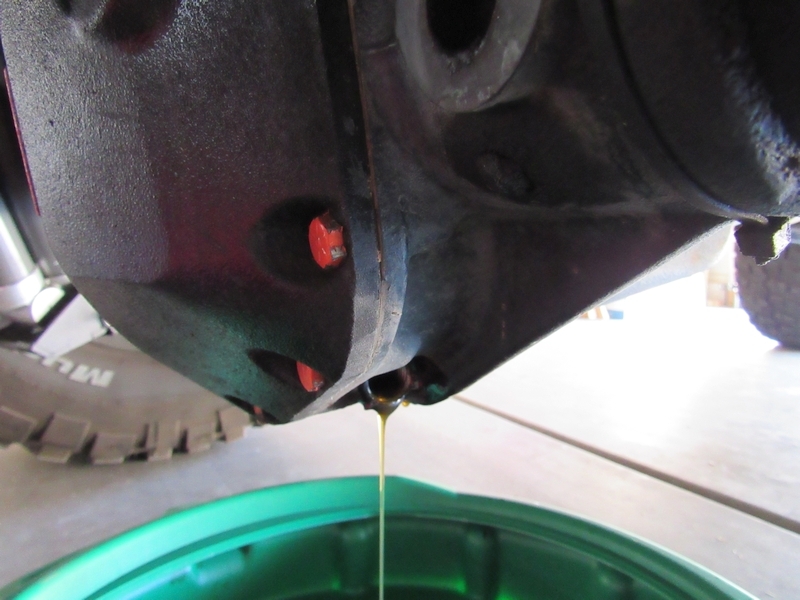 With the fill bolt removed, you can proceed to draining the old gear oil. Place an oil drain pan underneath your differential. Then, using a 3/8″ drive ratchet with a 3″ extension attached to it, remove the drain bolt from the base of it as shown. Allow your differential fluid to drain completely before proceeding. Your Jeep’s drain bolt is magnetic and the inside end of it will most likely be fuzzy with fine iron filings. 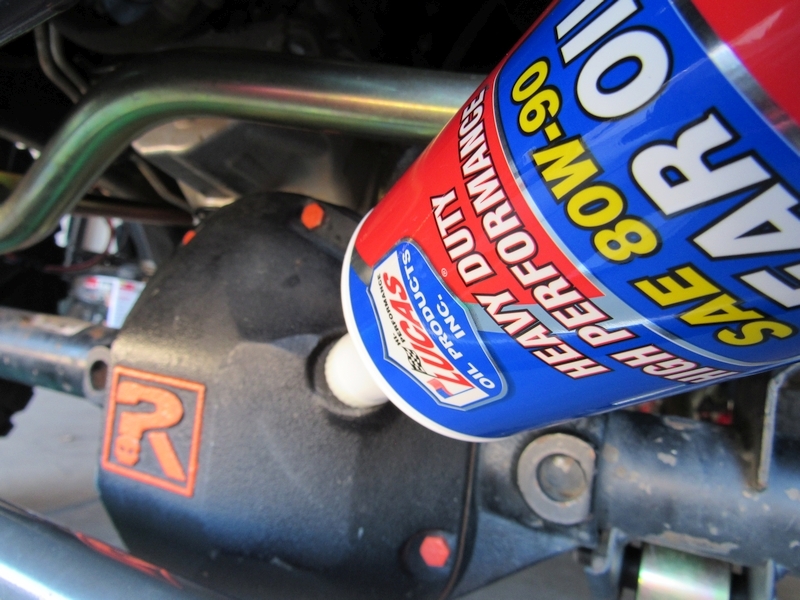 Use a paper towel and some brake cleaner to wipe the bolt clean. 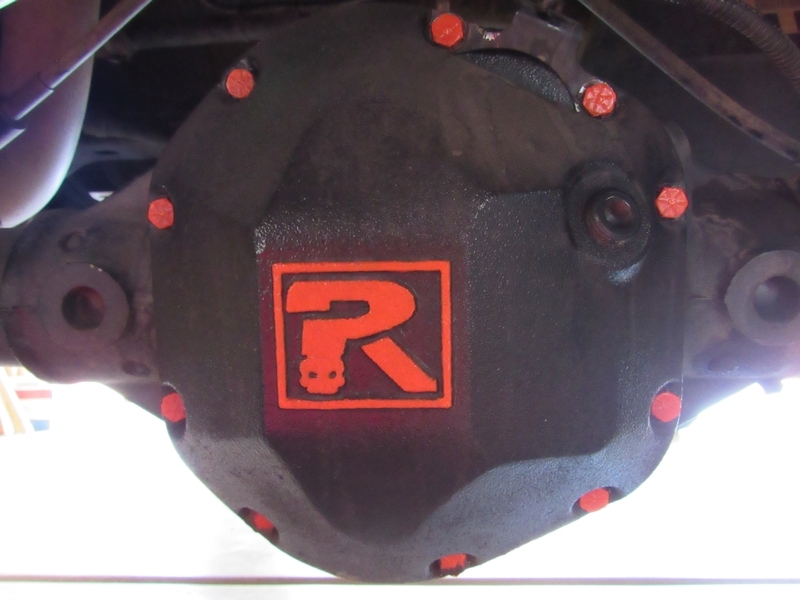 If you find any metal chunks, you should consider removing the differential cover in order to inspect the gears (if you do remove the cover you will need either RTV Silicone Gasket Maker or Lube Locker Differential Cover Gasket when reinstalling everything back together). Using a 3/8″ drive ratchet with a 3″ extension attached to it, reinstall your drain bolt back on to the base of your differential. Tighten this bolt to 25 ft. lbs. of torque. With the drain bolt installed and tightened, proceed to refill your differential with fresh gear oil. 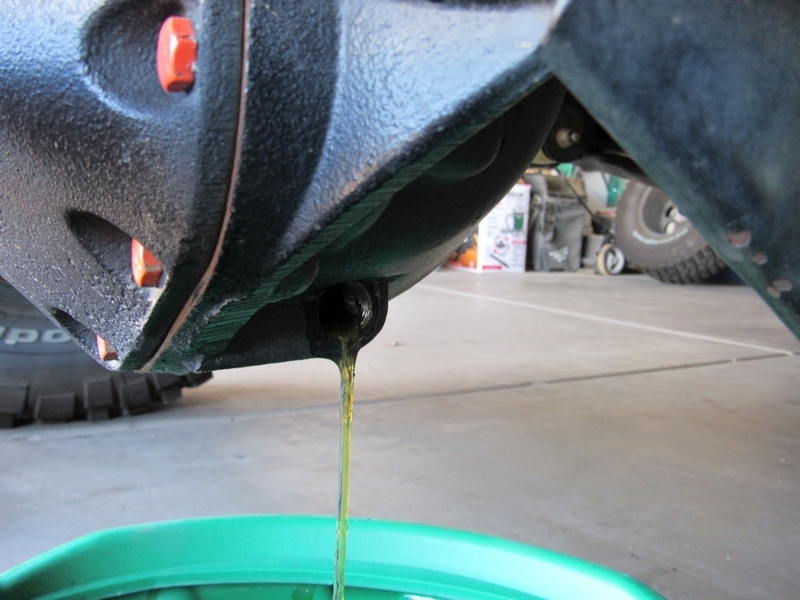 Pour in exactly the recommended amount of gear oil. If you still have stock differential cover, you can stop once fluid is oozing out of the fill hole. 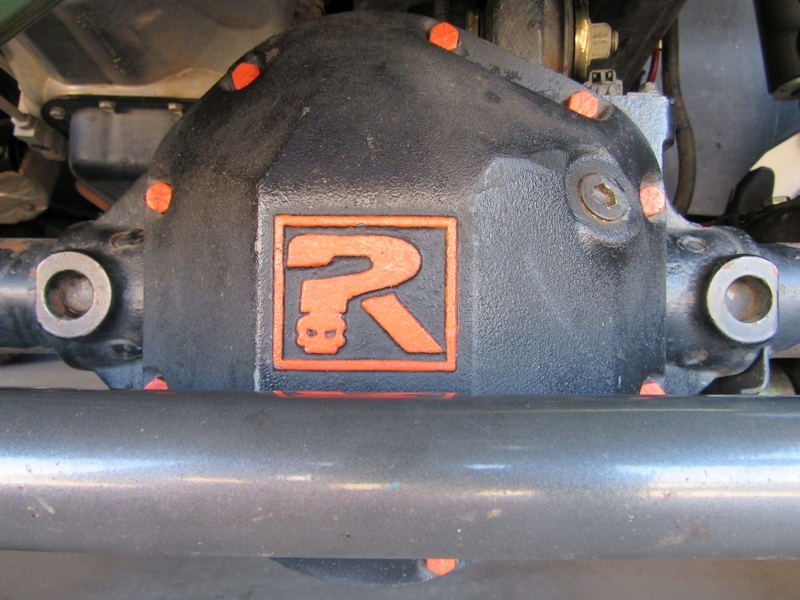 Using the square head of a 3/8″ Drive ratchet, re-install fill bolt on to the differential cover. Use a 3/8″ hex bit if necessary. Tighten the bolt to 25 ft. lbs. of torque. 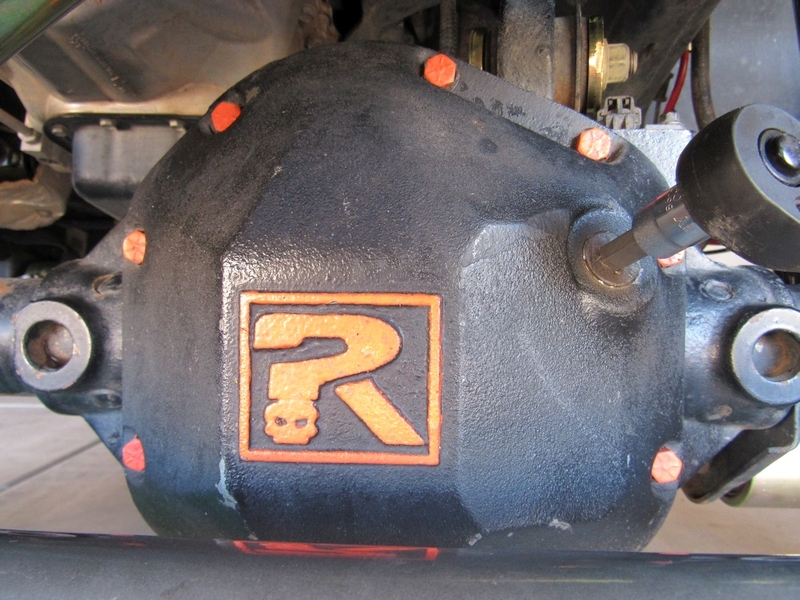 Follow the same steps with the rear differential. Ensure you have proper clearance and room to be able to insert the new gear oil bottle into the fill hole and tilt it upwards. 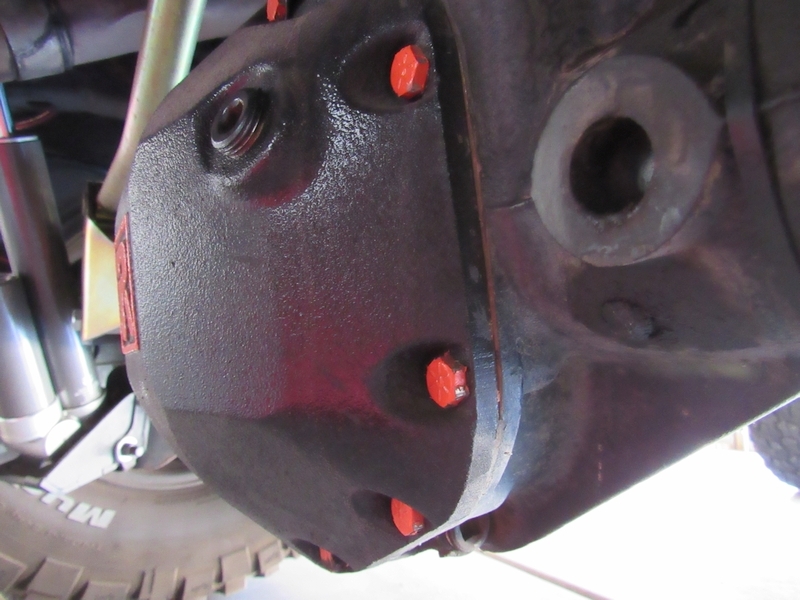 If necessary, you can jack up the frame of your Jeep and rest it on jack stands, to lift the track bar higher, above the differential. Place an oil drain pan underneath your differential. Then, using a 3/8″ drive ratchet with a 3″ extension attached to it, remove the drain bolt from the base of differential. Allow the old fluid to drain completely before proceeding. Use a paper towel and some brake cleaner to wipe the drain bolt clean. 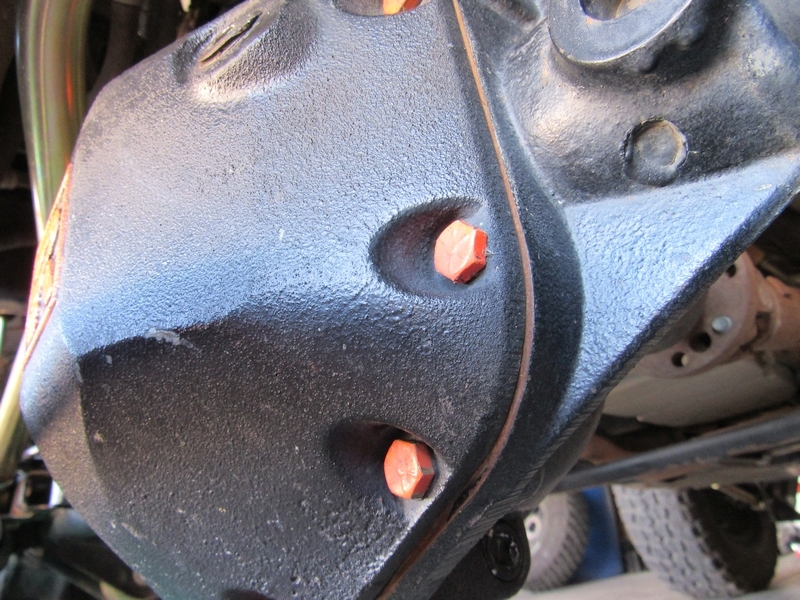 If you find any metal chunks, you should consider removing the differential cover in order to inspect the gears. 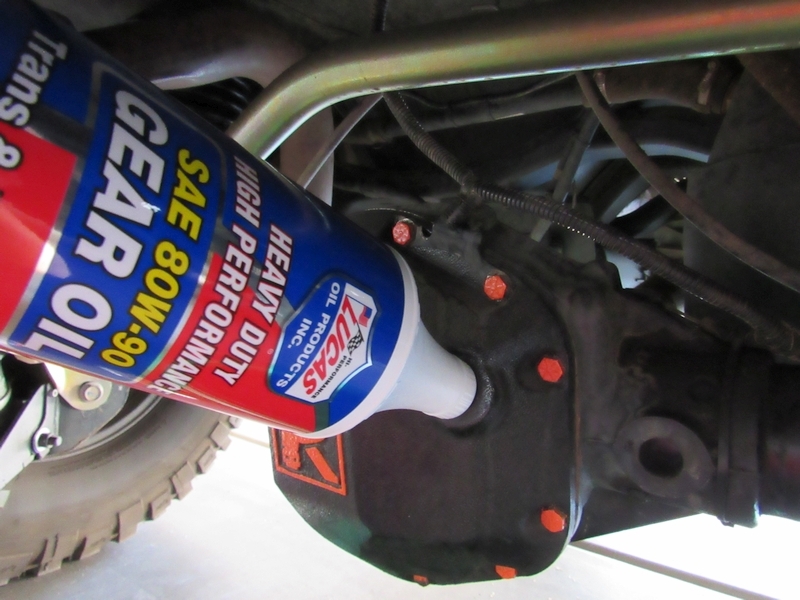 Pour the old gear oil into secure containers (use a funnel if necessary) and clean up any mess. Take your Jeep for a test drive to a local auto parts store where you can dispose of used oil safely and free of charge.